Fresh fruits and vegetables are good for us, anyone knows that. Award-winning culinary photographer Paulette Phlipot reminds us they're also the source of "simplicity, joy and fun. How can you not be happy looking at a cherry?" Her new fine arts show, "Unprocessed: A Closer Look at Real Food" reveals fresh fruits and vegetables as happy-making miracles of natural design, edible fractals and endless spirals. "They did the hard work," she says. "All I did was show them in their best light." Presented by Lipton Fine Art and running through the summer, "Unprocessed" features blowups of some of Phlipot's fruit and vegetable still lifes from her book "Ripe," with recipes from Cheryl Sternman Rule as well as an entire wall of produce from Idaho, Phlipot's home. 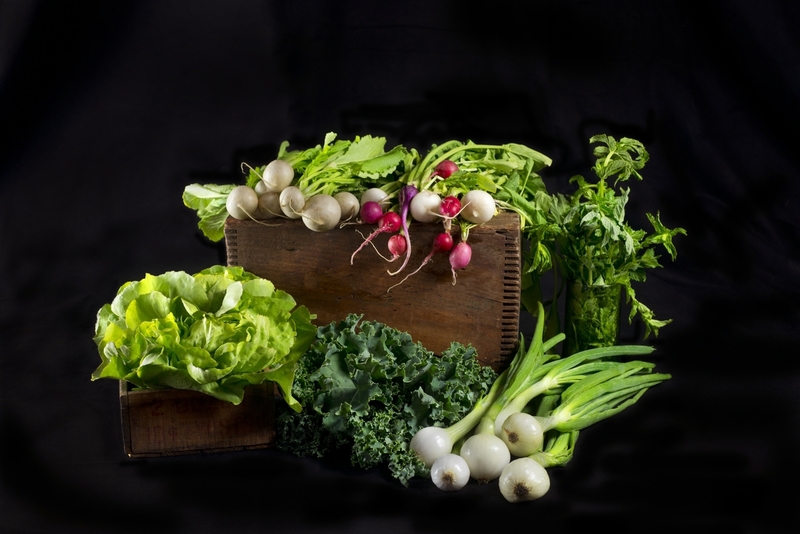 The images correspond week by week with the produce featured in the local CSA. "You see the progression through the season. At first, everything is really green in the spring. By the end of August, we're getting this explosion of color." Phlipot began her career by taking photography for regional publications, and still does, but from the start, she kept gravitating toward food fresh from the garden. "All I had to do is have a bunch of beautiful carrots, I'd be so excited," she says. "Whenever I had a spare moment, I'd grab plant-based food. I'd go to the weekly farmers market and oh, my gosh, I'd have to document this beauty. I just started capturing the food I was bringing in to eat." If fresh produce is Phlipot's muse, her daughter Cassidy, now four, "has been the driving force to pursue it in many more directions." Not only does Cassidy eat -- and prefer -- real food, "her excitement, her engagement when she can touch and see the fruits and vegetables encourages me to do what I'm doing." Phlipot, who often brings her daughter on photo shoots, captures that childlike sense of joy in her images. Her process is as pure as her subject. "There's nothing wrong about the filters and all that, but for me, it's always been easier to capture things as they are. I'm big on light, using natural light when possible. When that's not possible I work in the studio or create a studio setting on location. My technique begins with analyzing light." She's also big on spending time with her subject, to get to know it. That, she says, is when the personality, the character of produce comes out. "I'll take it in my hand and turn it around. I look at it. I will keep turning it around and moving it. Sometimes I cut into it -- that's a great pleasure, too, exploring, cutting into a cranberry. I want to go deeper, to know." 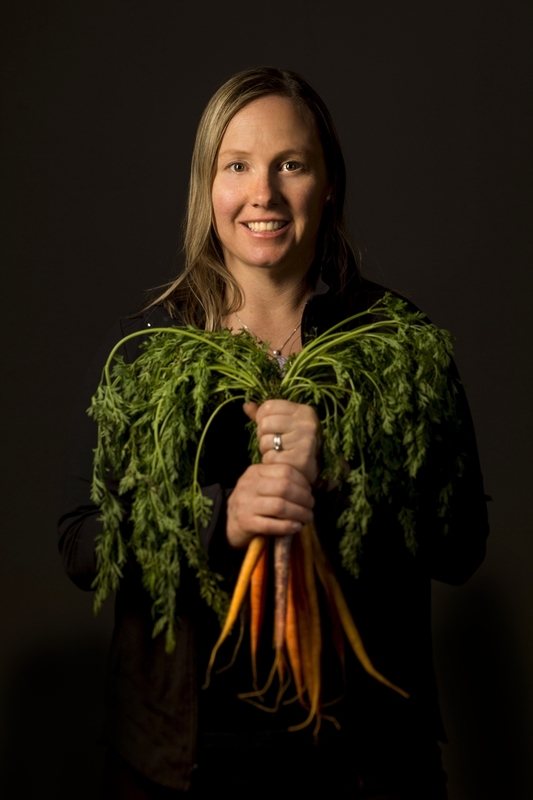 She aims to share both the pleasure and the knowing with "Unprocessed." "I try not to preach, I let the art speak for itself, but at the same time, I hope this show encourages other to approach food differently," says Phlipot. "So many of us are removed from where our food is coming from. I wanted to bring it back to basics, appreciating a cabbage for a cabbage -- what a work of art it is. We wonder why it's so hard to get children to eat fresh fruits and vegetables. Instead of pear-flavored food, let them have the whole pear experience -- bite into a pear." 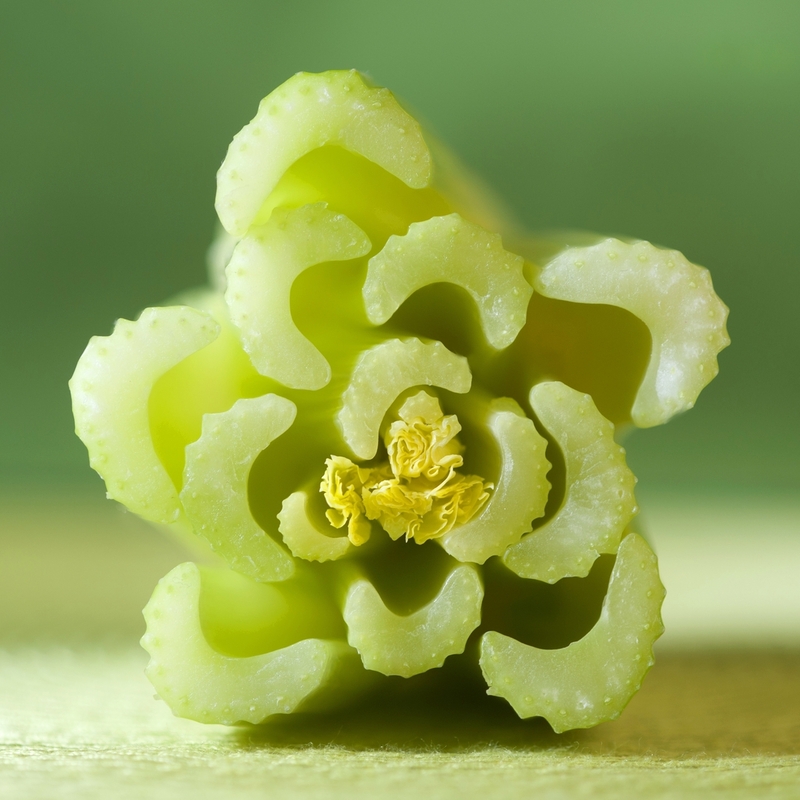 Phlipot turns celery into art. You can turn it into dinner It's the hero of this cool and crunchy salad, perfect now (celery season) and into summer -- (date season). Takes 10 minutes to throw together, tastes incredible. 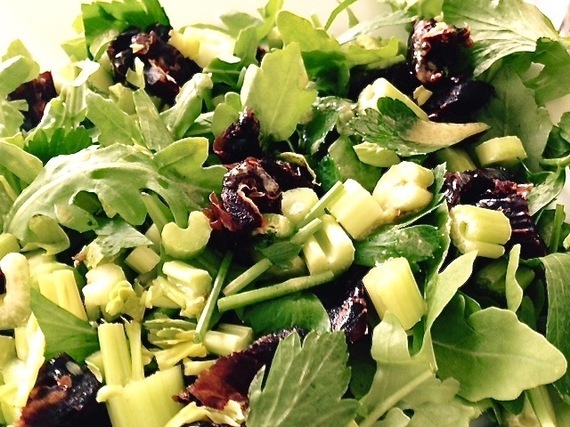 In a large salad bowl, combine arugula leaves and chopped celery. Do add the celery leaves -- that's where the bright essence of celery is. Add the chopped dates and pistachios. In a small bowl, make the dressing, whisking together the walnut oil or olive oil, Dijon mustard, agave and cider vinegar until emulsified. Pour over salad. Top with a good grind of pepper. Toss gently to combine.